You know you have style when even during casual times you want to still look your best and chances are you're a fan of wearing matching fashion short sets for men with your favorite pair of dress sandals like any number of styles that are made by Pronti. 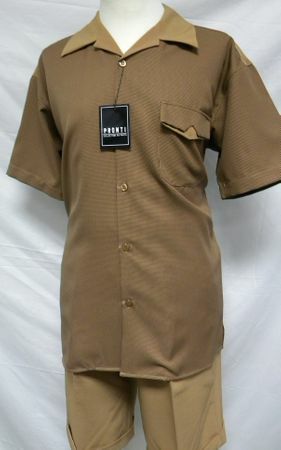 This luggage brown houndstooth short set features an open collar shirt style top with solid trim and matching solid color shorts that are knee length and ready for your style to shine. Fabric is wrinkle resistant poly.